Otto is a bear with a unique talent for racing cars. It's a talent that requires drivers to be fearless. Otto has only one fear. A great fear - BEES! When he crosses paths with some very smart bees that love racing as much as he does, he might need to overcome his fear if he wants to win. We have a nighttime tradition in our family, that we read a book every night before the kids go to bed. This has remained an important part of our bonding and family routine, this along with sitting down for dinner at the dinner table. There are many books to choose from, and finding books that everyone can enjoy is sometimes difficult. 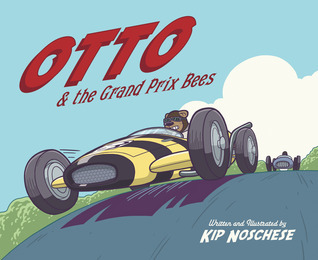 When we were given the opportunity to check out “Otto & the Grand Prix Bees” by Kip Noschese, we jumped at the chance. The immediate feeling you get when seeing, touching and opening this book, is that it is not the ordinary, run of the mill children’s book. The colors are soft and pleasing, and the illustrations have a classic, yet mature appeal that could see them just as easily framed on a wall as in the pages of this book. This may all stem from Noschese’s background as an animation designer for television shows such as Rugrats, The Wild Thornberry’s, Dinosaur Train, and Family Guy. Otto & the Grand Prix Bees follows a bear named Otto who has a love for driving and a fear of bees. This love of driving lands Otto in a predicament, which requires him to face and overcome his fears. The story is a well written, easy to follow story, that will keep the youngest to the oldest member of your family entertained. Our kids really enjoyed this book and I would highly recommend it for anyone with children. Visit www.ottobees.com or purchase your copy where books are sold. I really have a fear of spiders but I have learned to be brave and kill them myself. it sounds silly, but I have a fear of balloons. Since having my daughter, I have really had to get over that, because I don’t want to pass that onto her. I have a fear of heights also, but my senior year in high school for Communications class our very first assignment was to go to Kimball Camp and do the high ropes course. They had you separate into groups. A, you wanted to do it for sure. B, you didn’t want to do it at all. And C (the group I was in), the ones who did not want to do the course, but would try the zipline anyways. Well I was scared to death, but I climbed it, looked down and almost passed out, but I got over that and they told me to jump or fall whenever I was ready, but that they would not push me even if I asked them to, so I slowly walked off and it was SOOO MUCH FUN! I was always fearful of going on really high rides but since I’ve started taking the girls I babysit to Six Flags every week I’ve learned to act brave and become brave so they aren’t scared of going on any of the rides. As a result, I’ve gone on some crazy things that I’m really proud of! Thanks!